Who were the first people living in the area explored by Capt. Vancouver? How did they live? What were their beliefs? What kinds of foods did they eat? These are some of the questions which will be explored in this section. 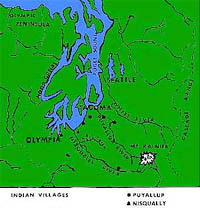 The two main tribes which lived in the area around Commencement Bay were the Puyallup (pronounced Pew-al-up) and the Nisqually (pronounced Nis-kwal-lee). They were friendly tribes and shared each other's berry picking and hunting grounds during the summer and fished together in the Nisqually and Puyallup Rivers in the winter. The natural resources of the area (water, soil, forest materials, minerals, and wildlife) were very important to these people. They depended on these resources around them to stay alive. Since they were limited to the local environment for food, shelter, and clothing material, they had developed ingenious and clever ways to use the resources to protect themselves from the climate in which they lived. Nature had provided them with rich and plentiful resources; food was everywhere - on land and in the water. The climate was mild, but it rained a lot during the winter as it still does today in the Pacific Northwest. The Puyallups lived in wooden houses built along the banks of the Puyallup River and shores of Commencement Bay. Many of these wooden houses, made of planks and bark of the cedar tree, were grouped together to form villages which helped protect each other and share in their work. The main village for the Puyallup tribe was located along the northern bank of the river, with a smaller village at Browns Point. 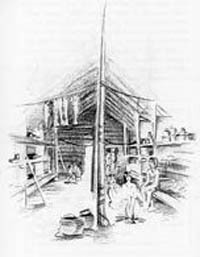 The "potlatch house", a larger wooden lodge where many tribe members gathered for important ceremonies, such as feasting and entertaining, was located along the northeastern bank of Commencement Bay. Their "medicine house" was near the present day Thea Foss Waterway on the southwest side of the bay. The "medicine house" was where they came to act out ceremonies they believed kept sickness away and dance special dances to frighten "evil spirits." The Puyallup and Nisqually tribes found a good deal of their food in the waters of the Puget Sound and in the many rivers flowing into it. There was a wide variety of fish and shellfish, but their favorite fish was salmon. The salmon as a food was so important to them that they observed a special ceremony each year. When the first salmon of the season began migrating up stream to spawn, they would perform a ceremony thanking the salmon spirit for providing them with such bounty and ask that more fish be sent to them. Methods for catching the salmon varied depending on the location where they were caught. Out on Commencement Bay, they would trail a line of tough nettle string from a canoe. On the end of the line was a hook made of bone and on that hook was a clam. In the rivers, salmon were trapped in nets or fences woven from branches that were placed across narrow streams. Smelt and herring were caught using cedar rakes at night. Large seals and sturgeon were speared using sharp wooden shafts. Shrimp and crab were gathered from the deep waters of the Puget Sound using small nets. At low tide, a variety of shellfish could be gathered on the beaches. Along the shores with its many inlets and bays, the Puyallup and Nisqually gathered baskets of clams, oysters, mussels, and a variety of barnacles. All they had to do to get their food was to catch or dig for it. There was no need for the natives to plant gardens for there was an abundance of plants and animals that met their needs. The women of each village most often went out to gather edible roots, berries, and nuts. The men of the village would hunt in the forests for animal meat. Among the plants gathered by the women were brake and wood ferns, dandelion roots and wild sunflowers, as well as cattail roots which they ate raw. A favorite vegetable was the camas, a bulb that was usually cooked in a hole in the ground with a fire built on top of it. The bulbs were then dried in the sun, which kept them from spoiling. They were used to make a tasty soup in the winter. Another favorite vegetable was the "wappato", an egg sized wild potato that had a sweet taste. It grew in shallow lakes and creeks. In fact, one of the lakes in Tacoma was named after the plant because it was a good spot to find it. Berries were one of the few sweet foods the natives ate. The variety of berries available was almost overwhelming; salmon berries, salalberries, serviceberries, elderberries, red huckleberries, wild strawberries, blackcaps and black huckleberries. In the late summer months the blackberries were ripe and heavy with juice. Most berries were eaten fresh, but some were dried. Salal, huckleberries, and blackberries were dried and mashed together and molded into little cakes called "tuckams." Hazelnuts and acorns were also dried and kept for winter eating. The animals the men hunted consisted of elk, deer, beaver, mountain goats, wildcats, cougars, groundhogs and bears. They shot with bow and arrow or trapped ducks, pheasants, and grouse. Drying and cooking the meat of both the salmon and elk or deer, carefully and properly, made it possible to keep for a long time. When frying deer steaks, they would wrap the steak with grease in strips of cedar bark and place them on hot, flat stones which made good frying pans. Many of their foods were cooked with seal grease or fish oil, which was used as cream, butter and even salad dressing. The only eggs the natives ate were those of the salmon (or roe), grouse, or duck. The Puyallup & Nisqually tribes were very resourceful and innovative people when it came to making clothing out of the materials available to them. The soft inner bark of the red cedar provided clothing for them and was used from the time they were born, until they were buried. The inner bark was stripped carefully from the trees and was cut into fine shreds or dried in long strips. It was soaked, steamed, stretched or dried. The strips were used to hold a baby in place on its craddle board and fluffy strands of cedar bark kept it snug and warm. With the baby safely on the mother's back in a cradle board, her hands were free to do her work and protect the baby. Trees also provided clothing for grown-ups. Cedar bark was woven into robes, capes, hats and skirts. Everyone in the family - the native men, women and children - had raincapes of twisted cedar bark; and there were several good reasons. Strips of cedar bark were easily woven into capes or ponchos and could be qucikly slipped around the shoulders. It was also light weight. But most of all, cedar was waterproof and kept them from getting soaked in the rain! 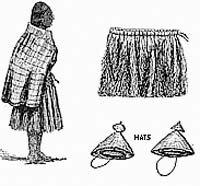 Animal furs and skins were also made into capes and skirts. The Nisqually wore a breech clout of buckskin all year. The breech clout was a strip of soft tanned skin worn between the legs and was fastened at the waist with a belt. Buckskin shirts were worn in the winter and when hunting in the woods. Instead of shoes, the Puyallup and Nisqually wore moccasins of deerskin or elkskin that were tied at the ankle with a strap. Travel was mainly by canoe - dug out of the massive cedar logs they cut down. With the trunk of the cedar lying on the ground it was prepared for becoming a canoe by first stripping it of the bark. Then, the part where the riders would sit was chipped out using wood chisels. Next, a slow fire was allowed to burn out more of the inside and the chipping was repeated. The hollowed-out log was filled with water and heated rocks were placed into the water to heat it. This heat and steam softened the wood for shaping. Poles of different lengths were placed from side to side stretch the wood. The skilled canoe builders took great care to not crack or split the wood. The Puyallup & Nisqually people did not build the large whale hunting canoes like those used by the ocean going tribes to the north in western Canada. There was no need for the Puyallup or Nisqually to build such large canoes. Most Puget Sound tribes got around on foot using established trails through woods and open fields. The Nisqually, however, were the only Puget Sound natives who raised and used horses. They were the only tribe that had open prairies large enough to make use of them. Their horses were gotten long ago from the tribes in Eastern Washington, across the Cascade Range. The Puyallup & Nisqually tribes used available materials around them to make tools for every day needs of hunting or catching food, preparing the food, cooking, making dugout canoes, as well as other tools. They created special tools to help them do their work. Most of their tools were made during the long rainy months of winter. The men carved flat pieces of bone or wood to make shedders which were used to scrape thin strips of bark from cedar trees. They made bows out of the best pieces of wood and sharpened arrows from ground stones or shells until they were as sharp as knives. Flat stones were polished to a thin edge. Carved handles of wood or animal bone were fastened to the stone with strips of leather. This tool was called an "adze." It was used to scrape and smooth the large planks for their houses. Salmon clubs and fishing hooks were made of bone and digging sticks were made of elkhorn. They were carved into animal figures. The designs on them told a story about the powers and spirits important to each man's life. Each man was proud of the tools he made for his family. He wanted his tools to show what a fine worker he was. 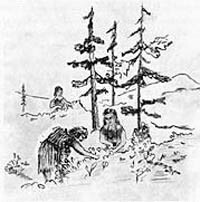 The tribes of the lower Puget Sound had many beliefs and customs, but the one belief and custom that they are most famous for is the potlatch. The potlatch was a gift-giving feast. It was sort of like Christmas, or a birthday party, but, instead of taking gifts to the party, guests who came to a potlatch received gifts from the host. Tribal chiefs gave potlatches to celebrate important events such as naming a child, a son's coming of age, or a successful hunt. Also, a marriage or completion of a new long house might be another reason. Potlatches were usually given in a large house built only for potlatches. Entire tribes were invited. They danced, sang and listened to speeches, held athletic contests to see who could run the fastest, climb the highest or jump the farthest. Tribes wrestled with each other and raced in canoes. They tested their strength to see who could keep going the longest and sometimes held contests to see who could eat the most. Big potlatches lasted three to five days. The big day was the last when gifts were given out. Potlatches were important to Puyallup & Nisqually people because a chief could show his wealth by the gifts he gave. To make his guests think he was of high social rank, he gave away the best of everything he owned. Gifts included canoes, blankets, furs, skins and food. A chief became especially important in the eyes of his guests if he gave strings of rare shells called "dentallium." These narrow shells were hard to find and were found only in the deep, cold waters off the west coast of Vancouver Island. Dentallium were valuable because of their scarcity. Sometimes they were used as money to buy things from other tribes. Families in the village worked closely with each other to help with the potlatch. They often gave their most valuable articles to the chief to make him appear wealthy to his guests. They did this in order to bring honor to their tribe. Even though a chief gave away everything they owned, they knew they would be repaid because there was a trick to the gift-giving! No guest at a potlatch could refuse the gifts offered him. An important guest had to give a potlatch in return to show how wealthy he was! To save "face," his potlatch had to be bigger and better then the one he attended. It was the goal of each chief to "out-do" the other. Over the years discoveries of skeletons, beads, and arrowheads have provided evidence that the points were an occasional burial ground. Usually the Puyallup Indians wrapped the deceased in robes or blankets, placed the body in a canoe and covered it with mats to shed water. The ends of the canoe were attached to two adjoining trees about 10 -14 feet above ground. Another method which was probably influenced by the white man was the method reported to be used on Browns Point Bluff for a native who was half Yakima, but lived with the salt water tribe. He was buried underground in a stony area. Over the grave was erected a cedar plank shed about two and one-half feet above ground. Another example was the skeletal remains that were discovered in the winter of 1960 by M.V. Peterson at his home on Whitman Street on the west side of Dash Point. The University of Washington Dept. of Anthropology completed the dig. The body of the skeleton was on its side in a fetal position with the elbows pulled into the mid-section and the hands in front of the face. 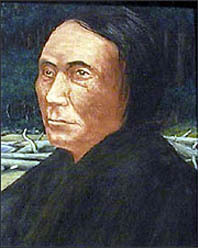 The head showed a similar shape to that of the Puyallup tribe. Two large stones were found below the hands and before the face. Artifacts found lying behind the skeleton at the pelvic level were two jade blades with handles, two jade blades without handles, and a smaller triangular blade of opal. Personal property as valuable as these items were often buried with the dead. No trade goods were found with the skeleton which may date it to before the time tribes had contact with each other.